This photo of ninebark was used as a previous banner photo. I change the banner photo with the seasons, but this image captures my attention again and again. Many avid gardeners think about their gardens year-round, so I know some of my readers are thinking about what to plant, or other ways to improve their gardens for next year. 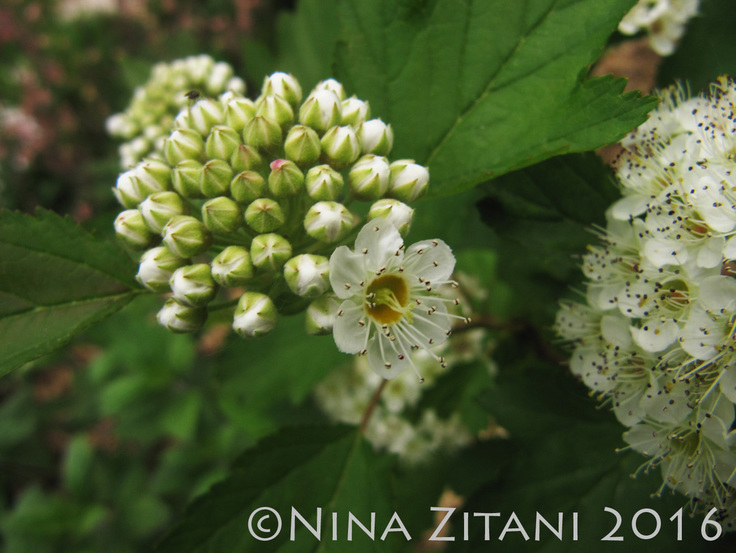 Beautiful ninebark, Physocarpus opulifolius, is a shrub in the rose family (Rosaceae). This native rose has abundant, showy white to pinkish late spring flowers, and interesting red or rust-colored fruits. The papery bark peels and sheds in what is believed to be nine layers, hence the common name. It's an important late spring source of nectar and pollen for our native insect pollinators. And like most native plants, it was used medicinally for a variety of purposes by several indigenous groups (for the literature references, search using the scientific name in the University of Michigan - Dearborn Native American Ethnobotany Database). And all-around awesome shrub for the garden.